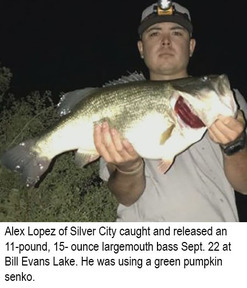 Bill Evans Lake: Alex Lopez of Silver City caught and released an 11-pound, 15-ounce largemouth bass Sept. 22. He was using a green pumpkin senko. Bluewater Lake: Anne Blanton of Los Lunas caught a 45-inch, 28-pound tiger muskie Sept. 22. She was using a Cabela’s floating snake head lure. Canjilon Lakes: Chris Rodriguez of Rio Rancho caught a limit of rainbow trout ranging from 18 to 21 inches Sept. 20. He was using a Pistol Pete. 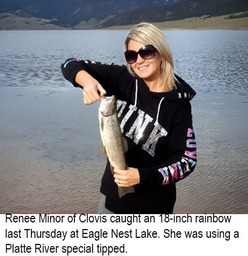 Eagle Nest Lake: Renee Minor of Clovis caught a nice 18-inch rainbow last Thursday. She was using a Platte River special tipped with chartreuse PowerBait. Rob and Dean Vey of Amarillo, Texas caught several northern pike ranging in size for 29 to 42.5 inches. They were using small spinners. Frank Maestas of Taos caught a 21.5-inch rainbow trout Sept. 23. He was using worms. Roswell Kids Pond: Chevy Wyatt of Roswell caught two channel catfish that measured about 25 inches each Sept. 23. He was using hot dogs and chicken liver at the same time. 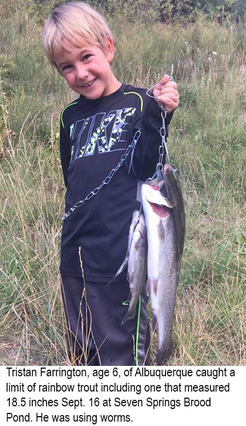 Seven Springs Brood Pond: Tristan Farrington, age 6, of Albuquerque caught a limit of rainbow trout including one that measured 18.5 inches Sept. 16. He was using worms. Tingley Beach: Giovanni Christopher, age 4, of Albuquerque caught a 21-inch channel catfish Sept. 21. He was using hot dogs. Trout Lake: Xavior Rodriguez, age 6, of Tierra Azul caught a 13-inch rainbow trout Sept. 16. He was using a Pistol Pete. Ute Lake: Eric Martinez of Clayton caught and released a 20-inch, 5.5-pound smallmouth bass Sept. 22. He was using a Rat-L-Trap. 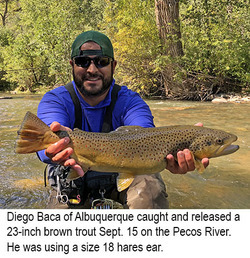 Pecos River: Diego Baca of Albuquerque caught and released a 23-inch brown trout Sept. 15. He was using a size 18 hares ear. Elephant Butte Lake: Julian Gillespie, age 10, of El Paso, Texas caught his first ever white bass Sept. 15. He was using a perch colored Flicker Shad. San Juan River: Terry Senters of Durango, Colorado caught and released a huge brown trout estimated to be 34 plus inches in length and 18 pounds Sept. 7. He was using a size 22 midge emerger and 6x tippet. Charette Lakes: We had no reports from anglers this week. Cimarron River: Stream flow near the town of Cimarron on Monday morning was 27.2 cfs. Fishing was good using stimulators, small midge patterns, San Juan worms, salmon eggs and worms for trout. Trout fishing at the Gravel Pit Lakes was fair using PowerBait, Fire Balls and worms. Clayton Lake: Fishing was slow to fair using worms and salmon eggs for trout. Anglers using worms also caught a few catfish and bluegill. We had no reports on other species. Fishing pressure has been very light. Conchas Lake: Fishing was good using senkos, tubes, square bill crank baits, chatter baits and creature baits for largemouth bass and smallmouth bass. Fishing was slow to fair using crank baits, sassy shad and minnows for walleye. Fishing was good using shrimp, hot dogs and chicken liver for catfish. Fishing was fair to good using slab spoons and blade baits for white bass. We had no reports on other species. The surface water temp was in the low 70s. Costilla Creek: Stream flow on Monday morning below Costilla Dam was 3.30 cfs. We had no reports from anglers this week. Cowles Ponds: Fishing was fair using PowerBait and salmon eggs for trout. Coyote Creek: Fishing was good using Fire Balls for trout. Eagle Nest Lake: Fishing was very good using white honey worms, PowerBait and worms for perch. Fishing was fair trolling wedding rings, kokanee killers and Platte River specials tipped with PowerBait for rainbow trout and kokanee. Fishing for northern pike was fair to good using spinners and spoons. Kokanee snagging season opens Oct. 1. Eagle Rock Lake: Fishing was fair to good using salmon peach PowerBait, Fire Balls, worms, wooly buggers and Pistol Petes for trout. Fawn Lake: Fishing was slow to fair using PowerBait and salmon eggs for trout. Gallinas River: Fishing was good using mop flies, San Juan worms, salmon eggs and worms for trout. Lake Alice: We had no reports from anglers this week. Lake Maloya: Fishing was good using PowerBait, worms and pink salmon eggs for trout. Los Pinos River: Fishing was fair to good using mop flies, prince nymphs, worms and salmon eggs for trout. Maxwell Lake 13: We had no reports from anglers this week. Monastery Lake: Fishing was good for anglers using wooly buggers, Pistol Petes, PowerBait and salmon eggs for trout. Morphy Lake: Work has begun on the dam and the lake will remain closed through the end of the year. Pecos River: Stream flow near the town of Pecos on Monday morning was 28.1 cfs. Fishing was good using bead-head pheasant tails, hares ears, copper John Barrs, salmon eggs, PowerBait and night crawlers for brown and rainbow trout. Red River: Stream flow below the hatchery on Monday morning was 31.7 cfs. Trout fishing was good using mop flies, stimulators, Fire Balls, PowerBait and worms. Rio Grande: Stream flow on Monday morning at the Taos Junction Bridge was 155 cfs. Trout fishing was good using mop flies, black and olive wooly buggers, red San Juan worms, copper John Barrs, micro mays, spinners and night crawlers. Fishing was slow to fair using spinners and wooly buggers for smallmouth bass. We had no reports on other species. Rio Hondo: Stream flow on Monday morning near Valdez was 6.14 cfs. We had no reports from anglers this week. Rio Mora: Stream flow near Terrero on Monday morning was 10.5 cfs. Fishing was good using hares ears, worms and Fire Balls for trout. Rio Pueblo: Stream flow near Penasco on Monday morning was 5.37 cfs. We had no reports from anglers this week. Santa Cruz Reservoir: Fishing was fair to good using wooly buggers for rainbow trout. We had no reports on other species. Shuree Ponds: We had no reports from anglers this week. Springer Lake: We had no reports from anglers this week. Storrie Lake: Fishing continued slow with just a few trout caught by anglers using PowerBait. Fishing pressure remained very light. Ute Lake: Fishing was very good using worms, tubes, minnows and grubs for bluegill. Fishing was fair using shrimp, night crawlers and chicken liver for catfish. Fishing was fair using drop shot rigs, senkos, chigger craws and curly tail grubs for largemouth bass and smallmouth bass. Most of the smallmouth bass were 13 inches or less. Fishing for white bass and walleye was slow with just a few white bass caught by anglers using spoons. The surface water temp was in the low to mid 70s. Abiquiu Lake: The lake level remains low and anglers should use extreme caution when launching boats. Four-wheel drive vehicles are recommended for launching. Much safer launching would be with canoes or kayaks. Fishing was fair using wooly buggers, top water lures, tubes, spinner baits and crank baits for smallmouth bass. We had no reports on other species. Animas River: Water flow below Aztec on Monday morning was 20.4 cfs. We had no reports from anglers this week. Albuquerque Area Drains: We had no reports from anglers this week. Bluewater Lake: Fishing was fair using spinnerbaits, top water lures and crank baits for tiger muskie. We had no reports on other species. Brazos River: Fishing was good using mop flies, San Juan worms and elk hair caddis for trout. Canjilon Lakes: Trout fishing was fair to good using PowerBait, worms, Fire Balls, Pistol Petes and spinners. Chama River: Monday morning flows below El Vado and Abiquiu were 604 cfs and 423 cfs respectively. Trout fishing below Heron Lake was good using wooly buggers, prince nymphs, mop flies and San Juan worms. Trout fishing below El Vado was very good using night crawlers, weighted wooly buggers, San Juan worms, red annelids and chamois leeches for brown and rainbow trout. Chuck Estrada reported that he, Bill Gonzales and Penny Frick of Albuquerque fished here over the weekend and caught limits of trout and several bass. They were using night crawlers. Trout fishing below Abiquiu was slow with just a few fish caught by anglers using night crawlers. Kokanee snagging season opens October 1 from El Vado Lake to the western boundary of the Rio Chama Wildlife Management Area. Cochiti Lake: Fishing was fair using crank baits for white bass. Fishing was fair using shrimp and chicken liver for catfish. Fishing was fair using top water lures, crank baits, chatter baits, spinnerbaits, creature baits and senkos for smallmouth bass and largemouth bass. We had no reports on other species. El Vado Lake: We had no reports from anglers this week. Kokanee snagging season opens October 1. Fenton Lake: Fishing was fair to good using yellow small midge patterns, orange, yellow and salmon peach PowerBait, salmon eggs and worms for trout. Richard Candelaria reported good fishing from his float tube. He was fishing this past Saturday and caught several rainbow trout using midge patterns. Heron Lake: The lake level has been dropping between one and two feet per week and the only boat ramp remaining open is the primitive ramp located between the La Laja ramp and the dam. Fishing has been slow for all species. Waters along the shoreline remains quite murky from the low water conditions. Jemez Waters: Stream flow on the Jemez near the town of Jemez on Monday morning was 7.44 cfs. Trout fishing on the Jemez and the East Fork was fair to good using worms, elk hair caddis and mop flies. Fishing on the lower Cebolla was good for anglers using mop flies, copper John Barrs and worms for brown and rainbow trout. Fishing on the San Antonio was good using copper John Barrs, mop flies, Fire Balls and worms for trout. Antonio Gonzales fished the Rio Guadalupe this past Sunday and reported good brown trout fishing and one surprise rainbow from the confluence of the Cebolla and Las Vacas. He was using a size 16 parachute Adams with a size 18 flashy hares ear dropper. He also reported that the stream was a dead zone from ash up to about mile marker seven. Laguna del Campo: We had no reports from anglers this week. Lake Farmington: Fishing was slow for all species. Manzano Lake: Fishing was fair using PowerBait and worms for trout. We had no reports on other species. Navajo Lake: Fishing was very good using spinnerbaits, buzz baits, crank bait, chatter baits, swim baits and plastics for northern pike. Fishing was good using chatter baits, senkos, drop shot rigs, baby brush hogs, crank baits and curly tail grubs for smallmouth bass and largemouth bass. Fishing was fair to good using worms and curly tail grubs for perch. Fishing was good using worms for perch. We had no reports on other species. Kokanee snagging opens October 1 and runs through December 31. Designated no-wake areas are closed from October 1 through November 8. San Juan River: Stream flow below Navajo Lake was increased to 850 cfs this past Wednesday and was flowing at 837 cfs on Monday morning. Fishing was very good using red larva, dead chickens, mini macs, ants, zebra midges, red annelids, RS2s and Griffiths gnats for brown and rainbow trout. Through the bait waters, fishing was good using jerk baits, mop flies, San Juan worms, copper John Barrs, PowerBait, worms and salmon eggs. Seven Springs Brood Pond: Fishing was good using PowerBait and salmon eggs for trout. Tingley Beach: Fishing was slow to fair using hot dogs and homemade dough bait for catfish. We had no other reports. Trout Lakes: Trout fishing was slow with just a few caught by anglers using salmon eggs and Pistol Petes. Alumni Pond: Fishing was slow for all species. Bear Canyon Lake: We had no reports from anglers this week. Bill Evans Lake: Fishing was slow to fair using senkos, tubes and creature baits for largemouth bass. We had no reports on other species. Caballo Lake: We had no reports from anglers this week. Elephant Butte Lake: Fishing was good using slab spoons, blade baits and crank baits for white bass. Fishing was good using creature baits, ned rigs, chatter baits, crank baits, top water lures and spinnerbaits for largemouth bass and smallmouth bass. Fishing was slow to fair using crank baits, tubes and swim baits for walleye. Fishing was very good using liver, hot dogs, minnows, homemade dough bait, cut bait and shrimp for catfish. We had no reports on other species. Escondida Lake: Fishing was slow for all species. Gila River: Stream flow on Monday morning was 89.6 cfs. We had no reports from anglers this week. Lake Roberts: We had no reports from anglers this week. Percha Dam: Fishing was fair using shrimp and beef liver for catfish. We had no reports on other species. Rancho Grande Ponds: We had no reports from anglers this week. Rio Grande: Stream flow below Elephant Butte Monday morning was 621 cfs. Fishing was very good using liver, hot dogs, shrimp, cut bait and night crawlers for channel catfish. Fishing was slow to fair using tubes and curly tail grubs for white bass and walleye. We had no reports on other species. Young Pond: Fishing was slow for all species. Alto Lake: Fishing was good using worms and hot dogs for catfish. Fishing was good using PowerBait, Pistol Petes and salmon eggs for trout. We had no reports on other species. Black River: Stream flow at Malaga on Monday morning was 37.6 cfs. Fishing was slow for all species. Blue Hole Park Pond: Fishing was good using PowerBait for trout. We had no reports on other species. Bosque Redondo Lake: Fishing was fair using chicken liver bait for catfish. We had no reports on other species. Brantley Lake: Fishing was good using spinnerbaits, crank baits, chatter baits, senkos, flukes and tubes for largemouth bass and white bass. We had no reports on other species. Chaparral Park Lake: Fishing was slow for all species. El Rito Creek: Fishing was very good using PowerBait and Fire Balls for trout. Eunice Lake: Fishing was slow for all species. Green Meadow Lake: We had no reports from anglers this week. Greene Acres Lake: Fishing was slow for all species. Fishing pressure was light. Grindstone Reservoir: Fishing was good using salmon eggs and PowerBait for trout. We had no reports on other species. Jal Lake: We had no reports from anglers this week. Lake Van: Fishing was slow with just a few catfish caught by anglers using liver and stink bait. Oasis Park Lake: Fishing was slow for all species. Pecos River: Stream flow below Sumner Lake on Monday morning was 78.9 cfs. We had no reports from anglers this week. Perch Lake: Fishing was slow for all species. Ruidoso River: Stream flow on Monday morning at Hollywood was 25.1 cfs. We had no reports from anglers this week. Santa Rosa Lake: Fishing was good using spinner baits, tubes, senkos, crank baits and creature baits for largemouth and smallmouth bass. A few bass were also caught by anglers using top water lures. Fishing was fair using tubes, crank baits and curly tail grubs for walleye. We had no reports on other species. Sumner Lake: Fishing was fair to good using cut bait, night crawlers and chicken liver for catfish. Fishing was fair using senkos, tubes, drop shot rigs and creature baits for largemouth bass and smallmouth bass. We had no other reports.